uring his lifetime, Louis Spohr, born on April 5th 1784 in Braunschweig (Germany), was named as one of the greatest violinists beside Niccolò Paganini. Unlike many of his contemporaries, whose works are celebrated today, Louis Spohr was already famous during his lifetime and he was considered as one of the great artists of his era, as a musician and conductor and, in fact, as a composer. His rich oeuvre includes more than 200 works, including chamber music, concertos, symphonies, several operas and four oratorios. 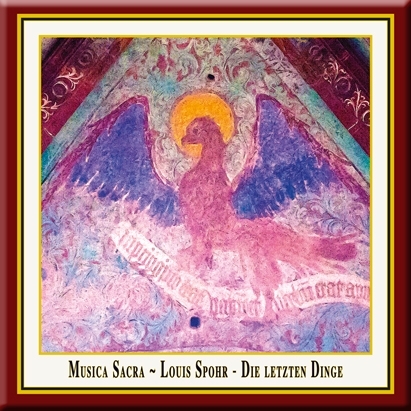 "The Last Judgement" was Louis Spohr's second oratorio and one of his most famous compositions these times. A contemporary reviewer discribed the oratorio as "one of the greatest musical creations of the age." "The Last Judgement" is originated in Kassel between 1825 and 1826, where Spohr has appointed as Music Director after a successful artist career. Spohr himself wrote about the successful premiere, which took place in Kassel on Holy Friday 1826 in a darkened choir under a cross, illuminated by 600-glass lamps: "I must say to myself - the effect was extraordinary! Before that I never had those emotion of satisfaction during the performance of one of my larger works!". Although this oratorio isn't well known today, the sucess of "The Last Judgement" is documented with numerous other performances during the first half of the 19th century. The libretto for "The Last Judgement" is written by the dramatist and music writer Johann Friedrich Rochlitz (1769-1842). The oratorio describes in two parts the scares of the Apocalypse and of the Last Judgement ("Babylon the great is fallen"), based on the Book of Revelation from the New Testament. At the end of the fight between God and the Devil a new heaven and a new earth replace the old. A new "city" is born: the New Jerusalem. The soprano Miriam Meyer was born in the German city of Osterode am Harz. After graduating from high-school, she started medical school in Hanover. In addition to that, she soon started studying vocal arts at the Hanover University of Music and Drama with W. Reimer. In 1997, she transferred to the University of Music in Lübeck as a student of Ulf Bästlein, where she received her diploma with distinction in spring 2002. She intensified her training by attending master classes by Renata Scotto, Irwin Gage, Charles Spencer, Kai Wessel, and Esther de Bros. Beside performances on the radio and on television Miriam Meyer gave numerous concerts, Lied recitals and oratorio performances throughout Germany and other European countries. At the Handel Festival in Halle in 2003, for example, Miriam Meyer's performance of the soprano solo in the oratorio "Messiah" with the Choeur des Musiciens du Louvre and the Lautten Compagney Berlin, conducted by Wolfgang Katschner, was a great success. At the Herrenchiemsee Festival of 2004, she made her debut as Susanna in "The Marriage of Figaro", conducted by Enoch zu Guttenberg. From 2002 to 2008, Miriam Meyer worked as a soloist at the Komische Oper Berlin with guest performances in Hong Kong, for example. In 2006 the soprano started cooperating very closely with Ton Koopman and the Amsterdam Baroque Orchestra. The German mezzo-soprano Ursula Eittinger studied singing at the Detmold Music Academy, where she was awarded a concert and opera diploma with distinction in 1990. While she was still a student she took part in various master courses, for example with Sena Jurinac, Kurt Widmer and Charles Brett. Ursula Eittinger has worked with ensembles like the WDR Radio Orchestra, the Hannover and Hamburg Radio Orchestras, the Bach-Collegium Stuttgart under Helmuth Rilling and the Munich Bach Soloists. Concert tours have taken her to the Royal Albert Hall in London, to Barcelona (Palau de la Musica) and many festivals such as the BBC Prom Concerts, the Schleswig-Holstein Festival and the Cracow International Festival for Old Music. The variety, which characterises he repertoire, is shown clearly in her television, radio and CD recordings (for example Schumann duets with Scot Weir), also in a duet programme with Barbara Schlick. Marcus Ullmann studied at the Hochschule für Musik in Dresden with Hartmut Zabel and Margaret Trappe-Wiel, later with Dietrich Fischer-Dieskau in Berlin and Marga Schiml in Karlsruhe. He began his career at Opera Houses including the State Operas in Dresden and Mainz, the Teatro La Fenice, the Opera House in Rome, Teatro Florence and the Los Angeles Opera, where he appeared successfully in most of the major Mozart-roles, in addition to staged versions of the "St John's Passion" and the "B-Minor Mass" by Bach, as well as "The Creation" and "The Seasons" by Haydn. Conductors with whom he has worked include Marcus Creed, Enoch zu Guttenberg, Hans-Christoph Rademann, Helmuth Rilling, Peter Schreier and Frieder Bernius. Beside his performances with choirs like the Dresden Kreuzchor and the Thomanerchor Leipzig and performances at many music festivals, Marcus Ullmann has given recitals in Tokyo, at the Wigmore Hall London, the Concertgebouw Amsterdam and the Opera House Cairo. The musical education of the Austrian Bass-Baritone Josef Wagner, born in 1975, began with a membership in a boys' choir and with violin and piano lessons. Later he studied singing at the University of Music and Dramatic Arts in Vienna, where he was inspired by Paul Esswood, Walter Berry and Christa Ludwig. His current teacher is the tenor Wicus Slabbert. After the debut with "Don Alfonso" ("Così fan tutte" and Dulcamara ("Elisir d'amore") Josef Wagner became a member of the Vienna Volksoper in 2002. His repertoire includes "Figaro" in "Le nozze di Figaro", "Don Alfonso" and "Guglielmo" in "Cosi fan tutte", "Masetto" in "Don Giovanni", "Papageno" in "Die Zauberflöte" (Mozart), "Dulcamara" in "L'elisir d'amore" (Donizetti), "Publio" in "La clemenza di Tito" (Mozart), "Alidoro" in "La Cenerentola" (Rossini), "Colline" in "La boheme" (Puccini), "Philebos" in "Der König Kandaules" (Zemlinsky), "Fra Melitone" in "La forza del destino" (Verdi) and other roles. He performs at the Salzburg Festival, the Vienna Volksoper and the opera houses of Bern, Geneva, Ireland and Japan. At the Israeli Opera he sang Lord Sidney in Il viaggio a Reims (Rossini). In addition to his career as an opera singer Josef Wagner also performes as a concert singer. Thus he gave concerts under the conductors Ton Koopman, Dennis Russell Davies and Nikolaus Harnoncourt in Vienna's Musikverein and the Vienna Konzerthaus. The Maulbronn Cantor Choir is the large oratorio choir of the monastery in Maulbronn. The choir was founded in 1948 as a federation of the Evangelic Church Choir Maulbronn and the choir of the Evangelic Seminar Maulbronn. In this tradition the choir is formed today with ambitious choral singers from the region and students and former students of the Seminar Maulbronn (gymnasium with boarding school). 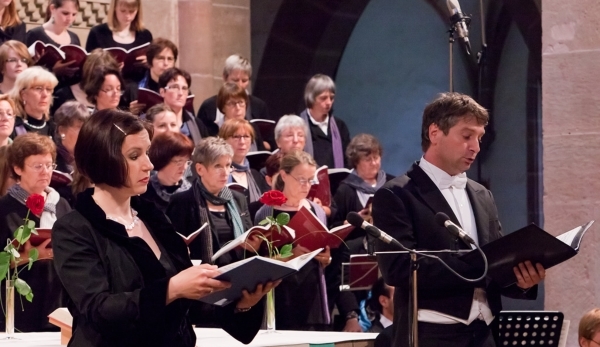 Over those many years of its existence the choir has performed the complete repertoire of popular oratorios and worked together with orchestras like the "Southwest-Radiosymphony-Orchestra Baden-Baden and Freiburg", the "Central German Chamber Orchestra", the "Southwest German Chamber Orchestra Pforzheim" or the "Baden Philharmonic Orchestra". Soloists of these performances were artists like Barbara Schlick, Maya Boog, Sandra Moon, Sophie Daneman, Marga Schiml, Elisabeth von Magnus, Hans Peter Blochwitz, Aldo Baldin, Marc Clear, Markus Brutscher, Peter Lika, Gotthold Schwarz and Ludwig Güttler. The German television station ZDF broadcasted a portrait about the Choir, and the choir has participated in live radio recordings for the SDR, SWR, Deutsche Welle and Deutschlandfunk. Jürgen Budday started teaching at the Evangelical Seminar in Maulbronn in 1979. This also involved his taking over as artistic director of the Maulbronn Monastery Concerts and the cantor choir. He studied church music and musicology at the Academy of Music in Stuttgart from 1967 to 1974. In 1992, he was named Director of Studies, in 1995 came the appointment as Director of Church Music and in 1998 he was awarded the "Bundesverdienstkreuz" (German Cross of Merit) as well as the Bruno-Frey Prize from the State Academy in Ochsenhausen for his work in music education. In 1983 Jürgen Budday founded the Maulbronn Chamber Choir ("Maulbronner Kammerchor"), with whom he won numerous national and international awards. At the Prague International Choir Festival, for example, Jürgen Budday received an award as best director. Since 2002 he has also held the chair of the Choral Committee with the German Music Council. Jürgen Budday has started a cycle of Handel oratorios that is planned to span several years, which involves working with soloists like Emma Kirkby, Miriam Allan, Michael Chance, Nancy Argenta and Mark Le Brocq (to name but a few). The live recordings of these performances, that have received the highest praise from reviewers, has won him international recognition. Till these days 10 oratorios by G.F.Handel are documented on discs. "No conductor and no choir have so consistently recorded so many Handel oratorios as Jürgen Budday and his Maulbronn Chamber Choir" (Dr. Karl Georg Berg, Handel Memoranda Halle 2008). Released, so far, are recordings of the oratorios "Paulus" und "Elijah " by Mendelssohn, Puccini's "Messa di gloria", the "Missa Solemnis" by Charles Gounod, Rossini's "Stabat Mater" and the oratorio "Moses" by Max Bruch., which are performed by the Maulbronn Cantor Choir under the direction of Jürgen Budday. Steige herauf, ich will dir zeigen, was geschehen soll! Und siehe, ein Thron stand im Himmel, und auf dem Thron ruht einer! Sei mir nicht schrecklich in der Not, Herr meine Zuversicht! Ich bin allein, bleibst du mir nicht. Verlassen bin ich, stehst du nicht zu mir! Der Freund vergisst, der Bruder weicht, ich schau auf dich, o Herr, auf dich, mein einzig Teil! das Siegel wird gebrochen (8,1), das Buch wird aufgetan (20,12). Halleluja! Sein ist das Reich und die Kraft und die Herrlichkeit von Ewigkeit zu Ewigkeit. Come up hither, and I will shew thee things which must be hereafter and, behold, a throne was set in heaven! Hail! To the one to have mercy on us! Do not be my terror in this misery, my Lord, my confidence! I am alone unless you are with me. I am left destitute if you are not on my side! The friend forgets, my brother leaves me. I behold ye, oh Lord, my only foundation! Alleluia! For thine is the kingdom and the power, and the glory forever and ever. This enterprising German label has recently served up some wonderfully crafted chamber and choral performances and this discovery by Spohr is no exception. Apparently 'The Last Judgement' (Die letzten Dinge - 1825/6) was an extremely popular oratorio in its heyday but it unfortunately fell by the wayside and is little heard today. Spohr treats the text with reverence and respect and although the music rarely rises above the mundane, the soloists and Budday ensure that the listener is engrossed in what is going on from first note to last. This is a worthwhile revival from the Spohr canon which deserves much wider currency.